OHHHH my. 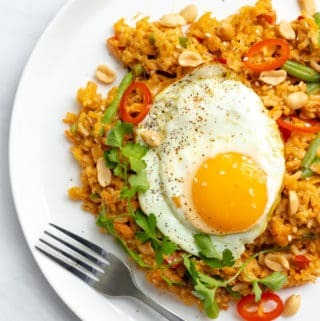 For this weeks recipe on GE we are giving the nations favourite dish a makeover. 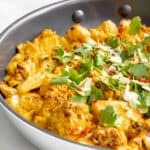 My roasted cauliflower curry is super easy to make, budget-friendly and will make you weak at the knees. Once you go curry, you don’t have to worry. Although I eat vegetarian/vegan 90% of the time, I have always found veggie curries thoroughly disappointing. Not this one I tell you!! Roasting the cauliflower first brings out it’s natural sweetness and creates an almost meaty depth and flavour. 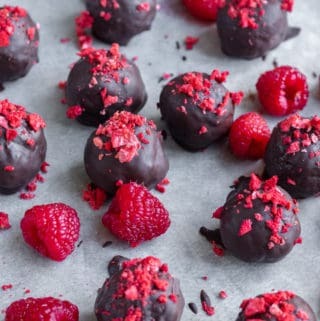 It’s really, really delicious. Serve it on curry night alongside some rice and naan and watch it become star of the show. 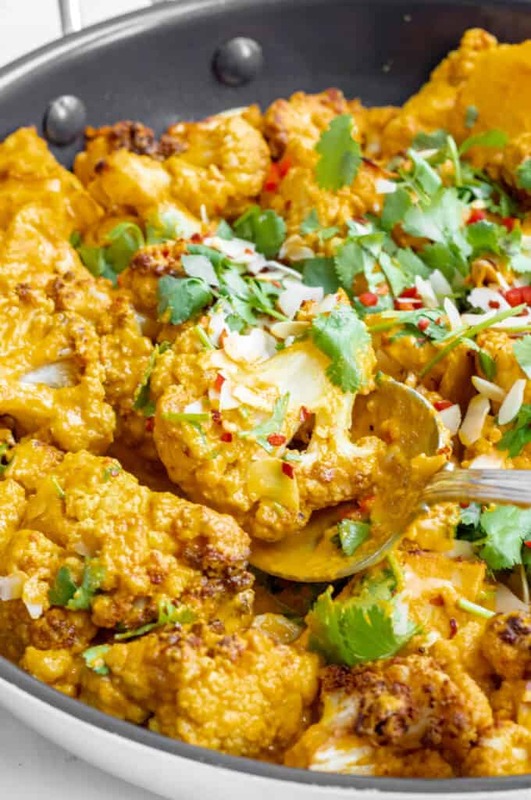 I hope you love this roasted cauliflower curry as much as I do. 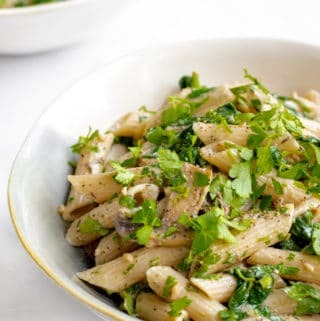 It’s a fab dish to jazz up your curry night and any leftovers taste even better the next day. Just be careful not to each too much, it may send you into a korma… Sorry, I’m getting curried away – okay, I promise that was the last one, I’ve got naan left. If you do make my roasted cauliflower curry, be sure to send me a picture on IG @georgieeatsuk, or leave me a comment down below. Keep smiling! 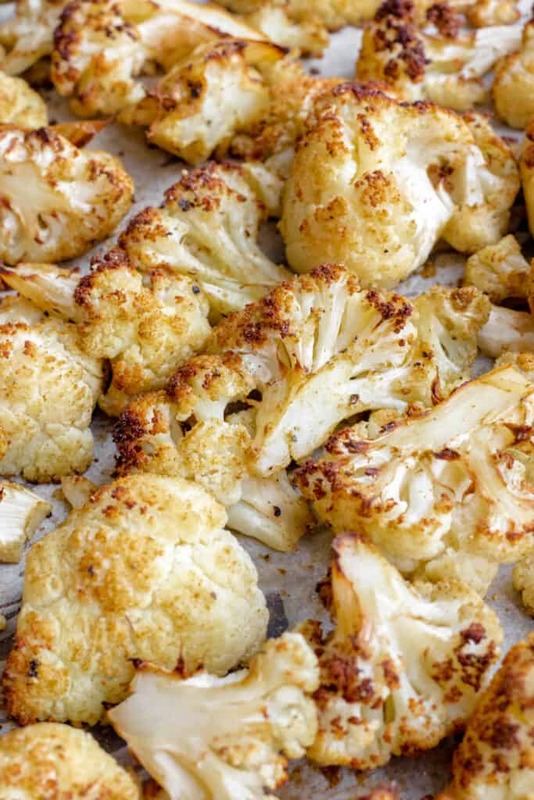 Sweet, tender roasted cauliflower in a super easy aromatic sauce. The perfect meat-free addition to your curry night! Vegan, GF & Healthy. Preheat the oven to 180°c fan/200°c/390°f. Cut the cauliflower into florets and the stalk into 1 inch pieces. 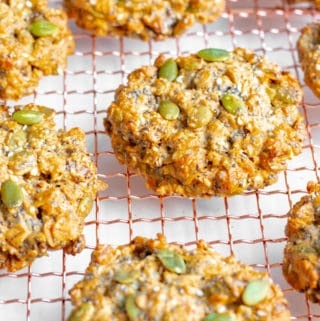 Place onto a baking tray and drizzle with 2 tbsp of olive oil, the cumin and a generous pinch of salt and pepper. Give everything a mix before roasting in the oven for 25 minutes, or until soft and starting to char. Meanwhile, make the sauce. Heat the remaining oil over a medium heat in a large pan. Add the onion and garlic and fry for 5-7 minutes until soft and translucent. Then add 100ml of the vegetable stock, tomato puree and curry powder and stir to create a paste. Fry for another 2 minutes or until the spices release their aromas. Add the remaining stock into the pan along with the creamed coconut. Season generously with salt and pepper and stir well until the creamed coconut has melted and everything is combined. Bring the sauce to a simmer and cook for 10 minutes, stirring occasionally. Remove the sauce from the heat and transfer into a blender to blitz until smooth. Pour the smooth sauce back into the saucepan and return to the stove. Taste, and adjust the seasoning. Add the honey, roasted cauliflower, and lemon juice. Stir well and bring back to a simmer over a low heat for 10 minutes until the cauliflower is very soft. If you find your sauce is a little thick here, mix in a splash of water. Divide the rice between four bowls before spooning over a generous helping of the curry. 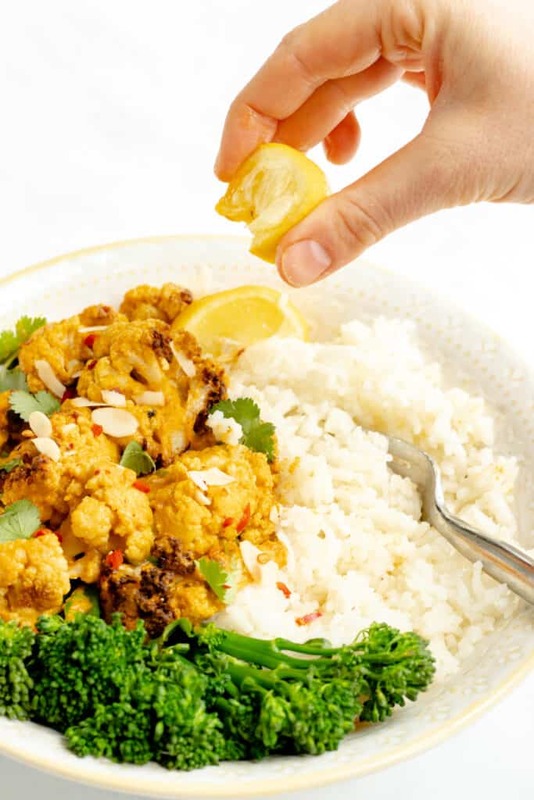 Serve with a side of broccoli and garnish with fresh coriander, crushed chilli, flaked almonds and a wedge of lemon. 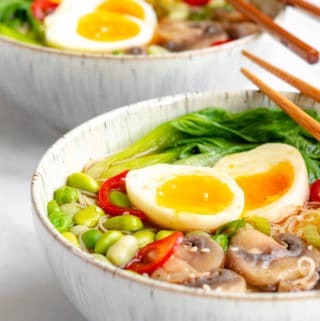 Enjoy whilst still piping hot. This curry is great to make ahead and can be kept in the fridge for up to 4 days. Just reheat over the stove with a dash of water until piping hot. Although I think the sauce is much better when smooth, if you don’t have access to a blender it can also be left chunky. If you prefer a milder curry, use a mild curry powder. If you like your curry extra spicy, you can use a hot/extra hot curry powder or add in an 1/2 – 1 tsp of chilli flakes when adding the spices. 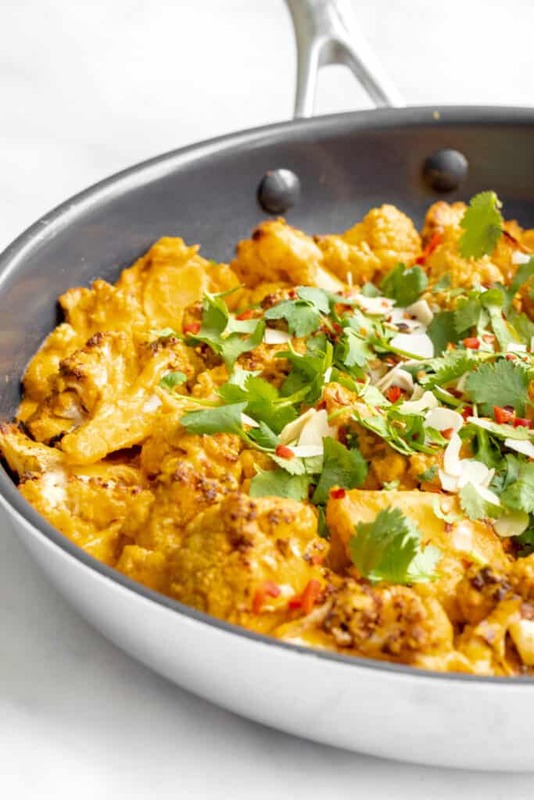 If you love this roasted cauliflower curry recipe, you will love my butternut squash and chestnut curry too!